Talented, hard-working and intelligent people don’t always get to the very top of their chosen careers, even when they deserve to. What they may lack is something that seems to come naturally to some people but not to others: Corporate Intelligence. Many successful professionals with good leadership skills fail to maximize their career potential because of a number of instinctive good habits – things that make them highly effective executives, well-liked and respected by their colleagues, but which are not best designed to progress their careers to the next level. Taking its inspiration from Niccolo Machiavelli, the famous chronicler of the sometimes deadly political struggles between the leaders of Renaissance Italy’s rival city states, the book exposes the hidden realities of corporate politics with wit and humour and explores the career strategies that lead successful executives to the very top of the corporate world. 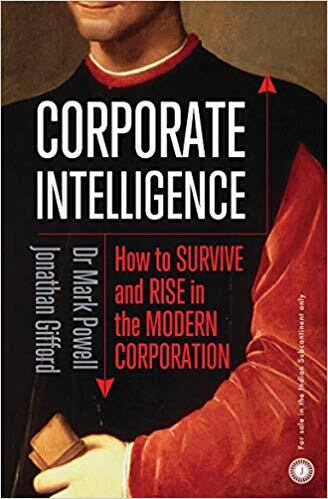 Corporate Intelligence explores the little-discussed though tacitly acknowledged fact that modern corporations are not rational and meritocratic operations in which hard work and talent will inevitably be rewarded, but complex social and political systems which must be skilfully navigated to obtain power and influence. Talent Is Not Enough. You Need Corporate Intelligence.